The new "Lugano" elevator sneakers by GuidoMaggi are definetely fall wardrobe must-haves. Suitable for all this season occasions, the Lugano are height increasing shoes, extremely comfortable and casual, entirely hand-made in Italy. 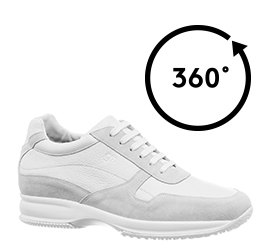 The upper in total white full-grain leather features elegant light gray suede details. The inner lining of soft goatskin ensures maximum comfort. The insole in genuine Italian leather and the white outsole in super light rubber of the latest generation with anti-slip, hancrafted, give maximum stability and durability. The invisible height increaser of the Lugano can be chosen between 2.4, 2.7, 3.1 or 4 inches depending on the needs of each individual customer. The GuidoMaggi craftsmen team allows several possibilities for customization.